Where in Holland would you like to go? View and find out more about the world-famous cities of Amsterdam, The Hague and Rotterdam, the cheese capitals of Gouda and Alkmaar and authentic places such as Volendam and Delft. Read up on the provinces of Holland and regions like the Veluwe, the Wadden islands and the bulb fields. In short: discover the most beautiful spots Holland has to offer! The capital of the province of Friesland is a mixture of shopping areas, cultural highlights and an exciting nightlife. Leeuwarden boasts over 600 monuments! Enough reasons for you to get a map with walking tours at the tourist information office. Shopaholics must visit De Kleine Kerkstraat, which is one of the most charming shopping streets in the Netherlands. 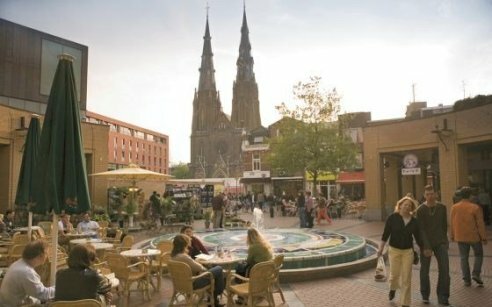 's-Hertogenbosch, which we call Den Bosch these days, is a wonderful city full of historic buildings, wonderful museums, great shops and welcoming cafés and restaurants. Go for a stroll and discover the medieval architecture, take a boat tour of the centuries-old canal system, or go for a bicycle ride along the fortresses. Den Bosch has many beautiful attractions on offer. Even more importantly, it has a warm and welcoming atmosphere. Jazz cafés, little restaurants, trendy bars – Den Bosch natives definitely know how to enjoy the good life. Den Bosch was elected the most hospitable city in Holland (2010, 2011, 2012 and 2013) for a reason. Discover the best places to go shopping, the hippest hot spots, and the best restaurants in design capital Eindhoven. Eindhoven bustles with creativity, unique hot spots and innovation. It is the city of unequaled events that merge design and technology, but also a city that offers great shopping and food. That combination of modern metropolis and typically Brabantse ambiance means that Eindhoven is one of the most exciting cities in Holland. We have lined up the best that Eindhoven has to offer for you. Dive into the city and discover it yourself! The fortified city of Nijmegen, Holland’s oldest city, will make you think you’ve gone back to Roman times. The city is full of magnificent historic buildings and centuries-old plazas, and is home to Holland’s oldest shopping street, the Lange Hezelstraat.